Freeverse Software used this week’s Game Developer Conference (GDC) to announce the release of its Mac conversion of Commander: Napoleon at War. The game costs $50. Commander: Napoleon at War lets you rewrite European history as you lead forces into battle in the 19th century. Commander: Napoleon at War is a turn-based strategy game originally developed for the PC by Slitherine Software. 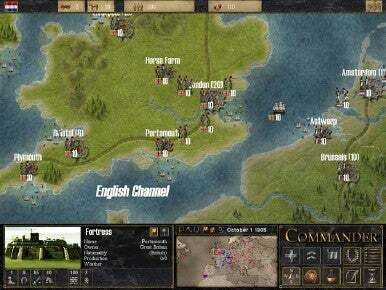 It’s the second game in the Commander series, following Commander: Europe at War. Instead of a World War II setting, this game takes you back to 19th century Europe, where Napoleon’s forces threaten to occupy all of Europe. You can play as Napoleon or as the coalition allied against him, including Britain, Prussia, Austria and Russia. The game includes a dynamic weather system that simulates mud, snow and storms, and includes 12 different unit types, including militia, line infantry, light and heavy cavalry, foot and horse artillery, frigates, ships of the line and pirates and privateers. You can recruit commanders from history including Ney, Blucher and Wellington. And it supports multiplayer gaming over a Local Area Network (LAN), hot seat, Play By Email (PBEM) and Internet play. System requirements call for Mac OS X 10.4 or later, 1.4GHz faster (PowerPC or Intel) and 512MB RAM, 300MB hard disk space.